Nurturing Minds Advisor and Blog Contributor, Shanna playing soccer at SEGA in 2012. World Cup fever is continuing to heat up as millions of people around the world tune in to watch. While the Men’s World Cup is almost over, have no fear, the Women’s World Cup is next summer and women across Africa will compete this fall in the CAF African Women’s Cup of Nations in order to qualify for 2019. While the World Cup only happens every four years, football, hereafter referred to as soccer, continues to play a massive role in many people’s daily lives, including at SEGA. Soccer, and sports in general, teach valuable life lessons including how to work as a team toward a common goal, hard work, dedication, and how to win and lose with grace. At SEGA, in addition to rigorous academics, girls can participate in sports including soccer, jump rope, volleyball, dance, running, and netball! SEGA students during Tanzania’s UMISETA sports competition for secondary schools. In May, SEGA sports teams participated in Tanzania’s UMISETA sports competition for secondary schools. Schools compete against one another, then between villages, municipalities, and regions, until they reach a nationwide competition. In netball, SEGA won both of their matches. In volleyball, SEGA beat the other school and in dancing the Ngoma, and in the 100-meter race, SEGA came in first! SEGA was the winner in almost every category. The SEGA students love sports, and are incredible athletes. So far, they’ve won most competitions between other schools and are known by many other schools around Morogoro. Several of SEGA’s best athletes were also selected for a Morogoro region team with the best athletes from other schools. For dance, SEGA brings a drummer to the school to teach dance so the students can learn about local dancing from different regions. Often, girls in one class at SEGA are mostly from the same area, when they graduate, they incorporate their traditional dance into a performance at the graduation ceremony. In addition to sports, SEGA offers a number of other extracurricular activities for students. These allow students to further pursue their interests and learn new skills outside of the standard curriculum, making SEGA students well-rounded individuals. The Science Club is the association of students and teachers who solve different science problems with theories and experiments. The Science Club started this year and is open for student from Standard Seven to Form 4 who have a passion for science. There are already 33 members and most are from Forms 1 and 2. The main objective of the Science Club is to ignite a deeper passion in science subjects, to help expand creativity and cognitive thinking and through experiments to help students discover different ways of solving science problems. On Tuesdays, you will probably find about 44 students meeting for English Club. This Club encourages club members to speak English and also helps to encourage other students to speak English, especially while on campus. Since all secondary school classes are taught in English (across Tanzania), it is critical that students are comfortable learning and speaking in English. The English Club helps all students to perform better in English class, and in all other subjects, and English practice helps to build students’ confidence in public speaking and expressing themselves. The Newsletter Club has 11 student members who provide SEGA students and supporters with accurate information about the school’s activities and achievements. They meet weekly and outline each issue of the newsletter– determining which stories to feature, how to lay out the stories and in what order and establish a timeline. Students individually interview other students, staff and volunteers, as needed and draft articles and headlines to be finalized with the Club’s teacher. The newest addition to SEGA’s Entrepreneurship Program is SEGA’s Beekeeping Club. 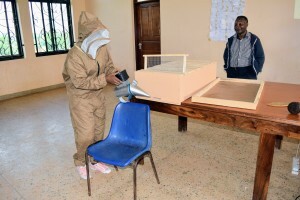 When a student signs up to be a member, an outside trainer facilitates a seminar on bees and honey processing and students go on to gain hands-on experience with keeping bees and processing honey. Sports and Clubs at SEGA are fun and fulfilling and give SEGA students a strong holistic education.